Now that The Hobbit: The Battle of the Five Armies, a.k.a. the “Defining Moment” of the Lord of the Rings saga, is nearly upon us, it’s time to acknowledge that this series has been the longest con in cinema history. Peter Jackson has pulled the wool over our eyes, and it’s about time someone blew the whistle. He’s not the David Lean of fantasy he’s made us all believe him to be. No, Peter Jackson, ladies and gentlemen, is the sick freak behind slapstick zombie horror Braindead. Dead Alive, as it’s known (or not known) in the States, isn’t even his most deranged work–just wait till you see Meet the Feebles. But it does have the infamous reputation of being the most violent movie ever made. Obviously, Jackson had greedily set out to make a name for himself right from the beginning, though it wasn’t “Lord CG-Crowds” or “Sir Most-Number-of-Endings-Crammed-Into-One-Film” just yet. The fact is, before cannibalizing Lean, Jackson had latched onto the coattails of the Masters of Horror. Braindead starts on Skull Island (probably foreshadowing the pervert’s return to the scene of the crime in 2005’s King Kong) to introduce the origin of the zombie outbreak: the Sumatran Rat-Monkey. One look at this stop-motion puppet and Jackson has effectively slapped some suspension onto our disbelief. The Rat-Monkey is then introduced, via a vicious bite, to patient zero, who is conveniently the grandmother of our hero, Lionel Cosgrove. And it’s at this breezy pace that Jackson wants to get the details out of the way so he can get to the meat. And by meat I mean the flesh of all the characters he’ll dispatch in sundry gruesome ways. Welcome to the era of B.J.S.S.–Before Jackson’s Self-Seriousness. Lionel is clearly modeled after Norman Bates, overbearing cleaver-wielding mother and all, but the similarities between Jackson and Hitchcock end there. Whereas the Brit showed less in favor of suspense (most likely to circumvent state censors), the Kiwi would rather show literally everything (most likely to stand out in a horror-saturated market where Sam Raimi seemed to have done it all). The next 90 minutes are a master class in how to shove aside story in favor of gross-out gags that involve senior citizens deteriorating into their lunch, a high speed chase after a zombie baby, and syringes shoved in all sorts of body parts. And to be perfectly honest, the plot is never missed. Even during a third act lull that gives our hero a breather (he also gets a girlfriend, if you must know), it quickly becomes apparent that Jackson is setting all the pieces in place for an endgame that will match, or dare I say surpass, the impressive scope of the battle at Helms Deep. There’s no describing the countless downright disgusting, yet admittedly hilarious, methods of dismemberment and mutilation that pour from Jackson’s mind. Even when you look at your watch and decide that the Kiwi might want to ease up, he manages to impress with his sheer innovation in practical effects that would make the purest Star Wars fan proud. That’s as romantic as it gets. In all seriousness, despite the extensive bibliography in this movie, Jackson has created something rather unique. 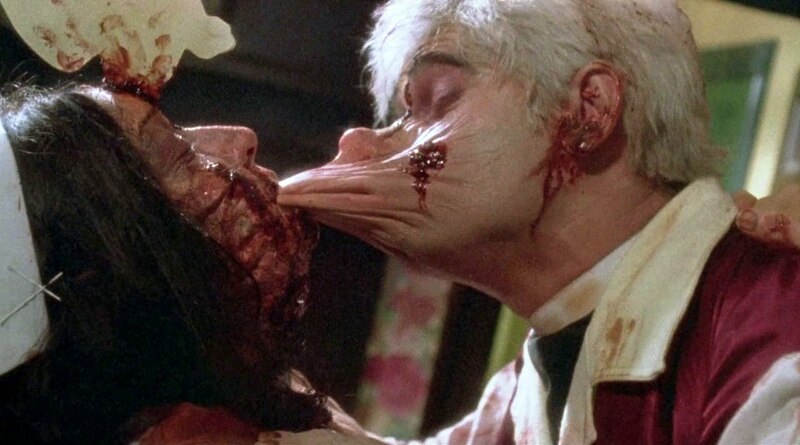 If I really wanted to stretch it, I’d say there are signs in Braindead of the filmmaker to come, in his dedication to tangible props and effects, the fusion of action and comedy, and his refusal to let a budget restrict his outlandish vision. But still, who in their right minds would let this guy direct The Lord of the Rings? ‘Cause it was a stroke of genius.